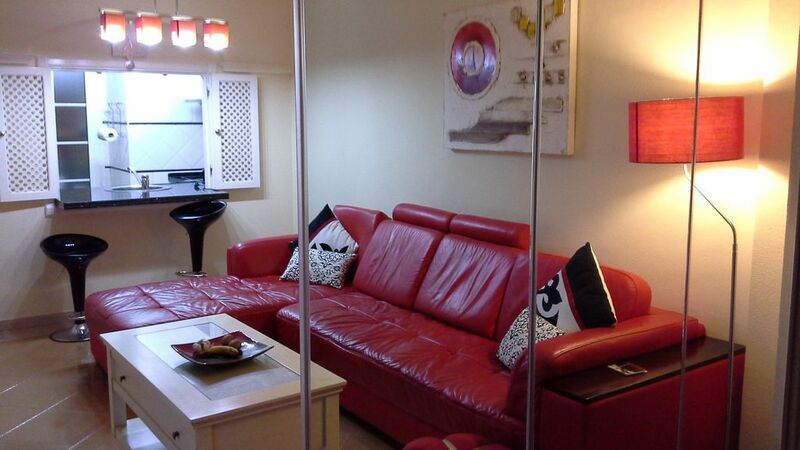 Very modern sunny apartment with air conditioning,(small extra cost) and central heating.Safe in bedroom 2. Everything brand new 2 years ago. Furnished with best quality furniture. Lovely views over the water to Isla Christina with fishing boats passing to and fro the little fishing village. Right next door to the magnificent Melia hotel. None resident quests are welcome in the hotel bars and to see their evening shows . Also in the pool areas. 10 minutes from Ayamonte and 20 minutes from the beautiful Algarve. 2 minutes walk to the beach and just cross the road to the shops, bars and restaurants of the very pretty marina, but at the same time it is a quiet location. Shared pool that opens from 1 st June until 30 th September , and kids play area and showers. Free angling directly behind apartment. My husband and i had always had a dream to buy an apartment in Spain.We visited many parts of Spain before we made our choice in Costa De le Luz.We loved it because it was unspoilt and beautiful and close to the Algarve as well. Also we have several friends who bought there. We run a small family business and had hoped we would be retired now and spending lots of time in Spain. Unfortunately we are still working and not spending as much time as we would like there yet ! We rent it obviously to help us with the upkeep and hope that our clients will like our apartment and respect that we have worked hard to buy and furnish it to the highest standard and therefore will look after it as we do when there. Luckily we have never had a problem in that respect and we have had some lovely clients , some returning again and again. It makes us happy to know people have enjoyed staying in the lovely area in our apartment and we always are at the end of the phone to guide them through any problems they may have. The views from our terrace are second to none and look out over the water to Isla Christina, There is always something to watch with fishing boats passing constantly. I particularly love it when the fishermen come back with their catch and the sea gulls are following the boats. An artists dream. Also people are walking and cycling past all day and it is a lovely place to while away the time with maybe a glass or two of wine in hand. We have recently fitted by folding windows to the terrace which creates either dining alfresco or on colder days , they can be closed and dining on the terrace can still be enjoyed in the warmth of the indoors . A second set of by folding windows from the living room to the terrace can also be opened up to the terrace to create a much larger living area . We have furnished the apartment in high quality modern designer furniture and it really has the wow factor. We love it every time we walk in ! Small terrace that will seat 6 to eat. Thank you very much Peggy for letting us stay at your beautiful apartment.It was exactly as described.Spacious,well equipped,furnished to a high standard, very clean and in the best location you could ask for.Watched the sun rise every morning from the balcony,what a sight.Also watched the fishing boats go out everyday.There were plenty of restaurants to choose from.Special mention for La Pamela restaurant,really went out of their way.Also the Neptuna bar just a short walk where we had tostado and coffee in the morning and coffee and drinks at night on our way back after our a meal.Ayamonte is also worth a visit.,good bus service. Weather was in the high 20's all week. It was our first time to this area and love how it keeps its Spanish tradition. Once again Peggy thank you very much and hope to be back again in the near future. Thank you George for your kind review. So pleased you liked it and had a good holiday. You are most welcome to return at any time. I have been to Isla Canela many times over the years and this was certainly one of the nicest apartments I have stayed in. The balcony overlooking the sea is perfect for relaxing and watching the fishing boats go by - I sat there for hours on end, glass of wine in hand, just admiring the activity on the water. The apartment is well furnished and remains cool during the day despite the very high temperatures outside, we did not use the air conditioning at all during the week. Finally, the location is perfect - just across the road from the Marina with its numerous bars and restaurants whilst also being a short walk along the promenade to one of the best beaches you will ever see. I highly recommend this apartment and will certainly be returning myself. I am so pleased that you enjoyed our apartment and its location as much as we do! You looked after our apartment very well and we would be more than happy to accommodate you again at any time in the future. Thank you for your kind review. So pleased you and your family enjoyed your stay at our apartment . The pool actually opens on 1 st June and closes on 30 th September as with nearly all the apartment pools in the area and in many parts of Spain . Personally Ibwould Luke to see them open it from the beginning of May but unfortunately we have no say in the matter although I shall now make a point of letting people know the opening dates in my advert. Also outside quests are welcome to use the pool in the hotel Melia which is opposite our apartment block and the apartment is second line to the beach there . Hope we can accommodate your family sometime again in the future. Thank you Peggy for the rental of your lovely apartment for the month of October. We are a mature couple (70's) who have been annual visitors to Isla Canela for the past 10 years. We have enjoyed self-catering holidays for the past 50 years all over the world, and this is one of the best apartments we have stayed in. Comfortable, clean and well appointed with excellent views from the balcony of local fishing boat activity, which entertained us whilst dining. Peggy is very helpful and efficient with the bookings, and the local agents also helpful with information and local bookings. The local area is ideal for golfing (every other day at very reasonable prices); cycling (local hire); and walking (5 km promenade). As others have mentioned the Huelva Golf Passport which enables one to play 8 different courses, within an hour's drive, at 20 euro's a round. This also enables one to experience different venues in the area. (I am unable to comment on local transport, as we always drive to Spain and use our own car). for a simple meal and evening nogging, and the nearby town of Ayamonte has excellent restaurants open all year round. There are also several beach bars where one can enjoy a relaxing meal or drink. Ferry trips to Cristina and Villa Real (Portugal)) are both enjoyable and cheap, and the festival market in Villa Real is not to be missed. There is also a hotel close by with evening entertainment, and open to anyone who wishes to attend. All in all a lovely apartment, with good local facilities and everything for one to have an enjoyable holiday. We hope return again next year. Thank you Colin for your kind review. We always love to hear that people have enjoyed our apartment as it is our pride and joy, and also enjoyed everyhing the lovely area has to offer. We would love to accommodate you again in the future. 2 minutes walk to the beautiful sandy uncrowded beaches of Isla Canela. 4 miles stretch with promenade and cycle lane. Beach bars close by offering fresh seafood and some have live music at night. Water sports available on the beach. Faro airport is a 45 minutes drive away. Seville airport 90 minutes drive. Ayamonte is a 10 minutes drive away. It is a delightfully lively very Spanish town with gorgeous shops, tapas bars and restaurants. From here take the 10 minute ferry crossing to Villa Real in Portugal renowned for quality bedding, linen and home ware shops and also lovely restaurants and harbor. Visit beautiful Seville only 90 minutes by car or go on day trip by one of the many excursions available. Take the water boat from the marina close by to Isla Christina and visit their weekly market or go to the lovely natural unspoiled beaches and fish restaurants. You over look Christina from our balcony. There is also great cycling over there as well as Isla Canela and you can take your hired bikes on the boat with you and make a day of it. Drive to Lepe 20 minutes away and ride beautiful Andaluciun horses on the beach (fast riding) or through the pine forest. (My favourite pastime while there!) The waters behind the apartment are teaming with fish and many people come to this spot to fish. If you like bird watching there are many rare birds here and it is a protected area. Booking Notes: £200 security deposit is payable with your second installment payment of your holiday which then acts as key/damage deposit and will be returned when key is handed back and apartment is checked to be okay. Should a breakage occur or excessive use of electricity or cleaning a portion may be retained. Payment in full is required 12 weeks prior to occupation. Late bookings pay in full at time of booking. A cleaning fee of £60 is included in the prices given. An extra charge of £50 is applied for occupation of 6 people Changeover Day: Flexible. Notes on prices: Long term winter lets available at very good discounted prices. Will negotiate price on application. N.B. Owner has the right to change prices at their discretion. Prices are for the property per week in UK Pounds.